I knew going in to 2019 that it would be a sprint to get to April, but I don’t think I was prepared for how many little pieces would be involved. A Troubled Accord was released on 2/14, and Partner to Trouble on 3/14. 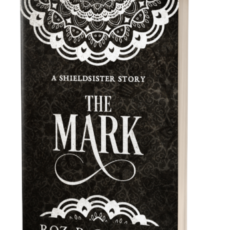 I indulged my inner geek by releasing on Red Day & White Day, which was something I’ve wanted to do since I started writing the Shieldsister series. I also threw a few surprises to myself since I published An Evening’s Truce, namely deciding that I was going to write, edit, and release The Mark. Those two shorts are a hers & his introduction to the protagonists of the series. 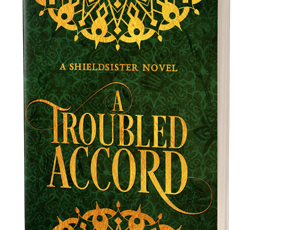 When I started writing Shieldsister I knew that I’d be doing periodic shorter reads along the path of the story. I like shorts because they let me investigate details that can’t always make it into the books. I’m approaching the series more like a television show or a universe of stories rather than just a book series, and the shorts help me get deeper into the universe than I would be able to just with novel-length stories. So, what else is coming this year? 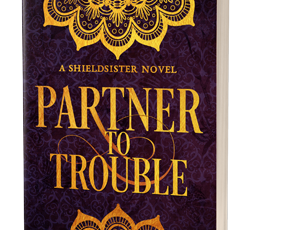 Paperback versions of both A Troubled Accord (#3) and Partner to Trouble (#4). I’m going to be releasing a standard print size as well as a large print edition of each book. I’m working on more Shieldsister, of course. There’s a short that comes after PARTNER that will be released to the mailing list later this year. I’m learning Wonderdraft so that I can get the world map transferred from my hand drawn version into something that will fit more easily into print volumes. I’m looking at WorldAnvil to put out a codex/compendium for the series, and to help myself keep track of things as the story expands. Anyone who’s read my fanfic knows that I’m a stickler for continuity, and while it’s something I keep track of in my fanfic, it’s even more important in Shieldsister. I’m plotting and drafting the next installments of the series, both a mailing list exclusive and a full-sized release. I’m organizing a BookFunnel release of free, full-length stories that are fantasy romance, romantic fantasy, and reverse harem fantasy that will be coming out in May. It’s going to be a busy period from spring into summer, but I’m looking forward to it. Have you read the series? Is there anything from the current releases that you’d like to know more about? Let me know in the comments! Why isn’t there a book tagging system like there is for fanfiction?